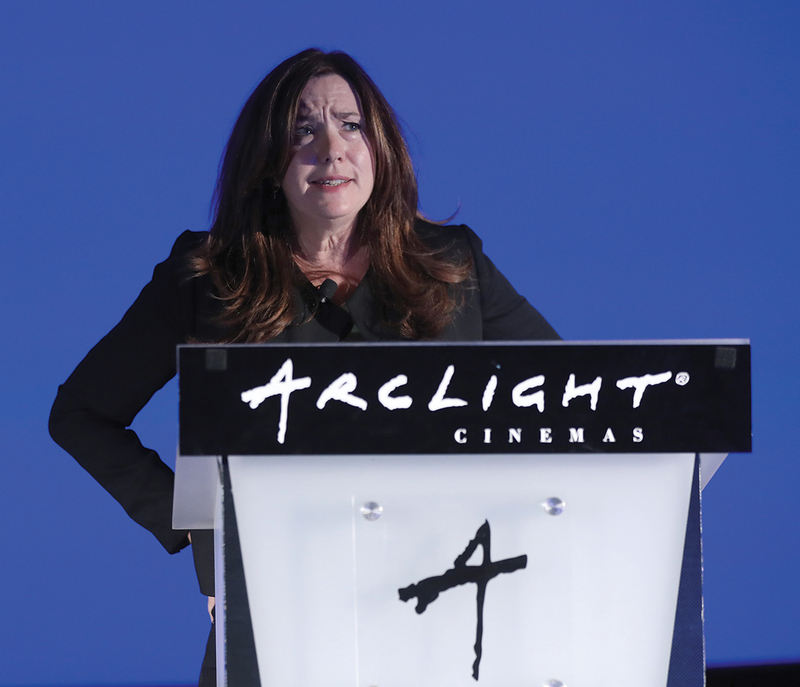 Editor’s Note: Molly Thompson is Senior Vice President of Feature Films at A&E Networks. In 2005 she launched the network’s feature documentary arm, A&E IndieFilms. What follows is an edited version of Thompson’s keynote address at the 2018 Getting Real conference. I wanted to begin this morning by posing what seems like a simple question: What is a documentary filmmaker? It’s one of those questions, it should be a piece of cake. But then I cleared my head and thought about it for a while—and to be honest I am still thinking about it. When I let the definition float to the surface in my mind, all I felt were contradictions. Okay, so: A documentary filmmaker is someone who captures real life on film and then forms that film into an experience that can enlighten an audience. Let’s start with “captures real life.” If a camera crew were to follow each one of you around for a few weeks, is that what the camera would do? Would it capture our real lives? In our real lives there is no script, no performance and no fabrication. Right? I’m sure I’m the only one here who finds that slippery. For starters, am I going to claim that there’s no script in my real life? I am reading this keynote address right now. And after I’m done up here, I’ll engage in conversation with some of you and we’ll exchange some remarks. Is that real life? As you tell stories of events in your own life, whether it be something that happened last night or 20 years ago, do you embellish? Do you flatter yourself? Do you leave things out? How do you edit yourself—maybe adding a line here, deleting a line there? Can we say there’s really no script involved? Many people don’t know that this is also true for a documentary filmmaker. The majority of all documentaries are scripted, and that’s as true for PBS’ extraordinary Frontline as it is for the winner of last year’s Oscar for Best Documentary, Icarus—which had four credited screenwriters. That’s more than most feature films, which require a script because actors are giving performances. That’s not even to mention the role of the editor in documentary film and the power to shape, rearrange, amplify, mute or even distort what’s being seen through editing. What about performances? Documentary filmmakers don’t explicitly employ actors—though even that’s perhaps up for debate. Just ask Joshua Oppenheimer, director of The Act of Killing, in which an elderly Indonesian man recreates scenes from a mass murder he participated in as a death squad leader. But maybe if by establishing an artificial premise, the filmmaker gets access to an even greater truth: a totally new and honest accounting of the past. Or even a reckoning with a whole country’s past horrors, as Oppenheimer surely did. But if we set aside the idea of acting as staging—delivering lines for the camera—the fact remains that performance is human nature. It’s just simply in our nature for all of us—well, most of us—to alter ourselves in front of the lens of a camera. But let me clarify a few thoughts on the subject of fabrication in documentaries. Once at a film festival, I had the pleasure of serving on a jury with the great Barbara Kopple, two-time Oscar-winning documentary filmmaker, and still one of the sharpest minds in our entire industry. I was trying to put my finger on what I didn’t like about a certain film, and Barbara nailed it for me. She said, “I don’t trust the film because I think the filmmaker sent that person on that journey solely to make this film.” She believed the whole thing was built on a false premise, a fabrication. She spotted it and so did I—and so does the audience. It’s like when you’re trying to be convinced of something by a person who is constructing a version of themselves for the camera—or worse, lying. But of course, for documentary filmmakers this is a gray area as wide as the ocean. With a simple YouTube search, you can find “documentaries” that assert falsehoods—that the Holocaust never happened or that Sandy Hook shooting was a hoax perpetrated by the government to seize guns. Absurdities that are megaphoned as truth. And I certainly don’t intend to soil legitimate documentary filmmakers by putting them on the same level as ghouls like Alex Jones. But as we near the 100th anniversary of the classic 1922 documentary Nanook of the North, about an Inuit tribe in the Arctic, we’re reminded that documentary has always grappled with the legacy of director Robert Flaherty, who staged multiple sequences to render his view of his subjects’ lives. That brings me to reenactments, which also could very easily be the subject of their own keynote address. Of course, there’s the fantastic filmmaker Errol Morris, a chief architect in the art of staged reenactments, especially with his dazzling true-crime documentary The Thin Blue Line. His stylish reenactments created a perceptive and clear version of events that revealed the truth, and the film led to the release of a wrongly imprisoned man. It also reminds me of Marie Colvin. She was the tough and tireless war correspondent who covered conflicts all over the world for London’s Sunday Times. She gave her life to cover the story of what was happening in Homs, Syria, in 2012. Matt Heinemann, the brilliant documentary filmmaker who I worked with on Cartel Land and City of Ghosts, has just completed a feature film about her life, starring actress Rosamund Pike. But here’s why I mention Marie Colvin. I worked on a documentary called Under the Wire, which is also all about her, told from the point of view of Paul Conroy, who was her photographer; he survived that trip to Homs. It’s a very important and very gripping film. While working on it we were confronted by a sort of documentary ethics question. BBC was uncomfortable with some of the re-creations in the film because they aren’t openly disclosed to the audience as re-creations. If it looks too much like real footage, the argument goes, then it gets into a perilous area. Personally, I was fine with it. In this case, every situation is different. My husband was not. And that’s also fine. So we might have a disagreement, which is among the scores of disagreements that all of us could have right here this morning about the question I posed. What is a documentary filmmaker? Since I don’t know that there’s a solid answer that we can all agree on, I’m going to propose an exercise to help figure this out. I’m going to take five other professions and look at how they each entwine with the DNA of the documentary filmmaker—and in doing so, I hope to elaborate on the critical importance of documentary filmmakers in our world. Since I’ve just mentioned Marie Colvin, I’ll begin with the most obvious: Documentary filmmaker as journalist. Journalists, contrary to some things you may have heard, are in pursuit of one thing and one thing only: the truth. If two people walk outside, and one says it’s raining and the other says it’s not, a journalist does not report that it might be raining and it might not. A journalist goes outside and finds out if it’s raining. I don’t have to remind you about how much journalists have been under attack, how an ugly totalitarian term like “enemy of the people” has been dredged up by people who should know better. But example after example illustrates the ethical standards set by great journalists. Look at The Washington Post, which won a Pulitzer Prize this year for its coverage of the special Senate election in Alabama. In covering that race, the Post received a tip from a woman who said Republican candidate Roy Moore, who was under fire for sexual assault accusations, had impregnated her when she was 15. And there’s incredible undercover footage of that reporter’s meeting with her. But there was a problem with the woman’s story: She was lying. The Post discovered she worked for a right-wing sting group. She was trying to plant a fake Roy Moore story to prove that The Washington Post publishes fake news. She ended up proving that The Washington Post does not publish fake news. Maggie Haberman of The New York Times, whose beat for the last three years has been Trump World, has been criticized for not grilling the president hard enough during interviews. But good journalists take many forms and in Maggie’s case, she allows him to speak—since there’s no filter anyway—and doesn’t just simply go in for the kill. I’m reminded again here of Cartel Land, Matt Heinemann’s documentary about the US/Mexico Drug War. There was one review of the film in The New York Times that actually criticized the immersive, observational nature of the film and said there should be more expert interviews, talking heads and tougher questions. Why? Do we not trust the viewer to be able to observe? Matt has an incredible gift for gaining emotional intimacy, especially with men living on the edge. He filmed inside a torture chamber, he was in meth lab —he was documenting things the way a journalist would but then he put it together in a much more experiential, challenging piece of work. That’s daring—like the best journalism is daring—because it requires us to draw conclusions from what we’ve seen. How do you feel as a viewer if the filmmaker gives a subject room to lie? In The Imposter, the director Bart Layton dove into the subjective nature of the truth to tell the story from three perspectives—the family of the boy who went missing, the man who was his imposter, and the detective and FBI agent who were investigating. And in early focus groups we had people who wanted to be told exactly what happened; they wanted to know the imposter was a psychopath, so they would no longer have to grapple with the uncomfortable complexities of the situation. This is where I’d cite the work of Claude Lanzmann, the tireless director of the nine-hour Holocaust documentary Shoah, who spent years and years excavating eyewitness stories, which are as real as physical artifacts. While making the film, he spent days wandering through the South Bronx, visiting more than 50 barbershops for one Holocaust survivor—who he eventually found and interviewed—in one of cinema’s most incredible interviews of all time. I recently worked with Charles Ferguson, who has made definitive documentaries on the Iraq War and the financial crisis, and now has directed an epic, amazing four-hour film on Watergate—which, by the way, is subtitled How We Learned to Stop an Out-of-Control President. Frederick Wiseman must also be mentioned. He’s 88 years old and still making a documentary a year. His films examine the inner workings of institutions—from hospitals and libraries to opera houses and boxing gyms—and his style is highly observational and non-manipulative, no narration or interviews, just the thing itself, onscreen, for us to look at and examine. But as a director, like a historian, Wiseman is making thousands of choices. By letting us see how these systems operate, he’s offering us the raw materials to learn more about our own worlds. The same could be said of the Maysles Brothers, Albert and David, who made Salesman and Grey Gardens, among other heartbreaking looks at people on society’s edge. But Al Maysles once said to me he couldn’t stand when people would contrast documentary with narrative films; he said a good documentary is a narrative film. Now here we have all the documentary filmmakers who have helped explain how we react to the world, how we face challenges—and who find universal lessons in the struggles of others. I had the great gift of working with Roger Ross Williams on Life, Animated, about writer Ron Suskind and his son Owen, and their family. Owen is autistic and has learned to communicate through the language of Disney films. The film was a powerful experience for the Suskind family to make, but it’s also full of universal lessons. Also there’s Murderball, another wonderfully open-hearted documentary, centering on quadriplegic athletes who play wheelchair rugby. The two directors, Henry Alex Rubin and Dana Adam Shaprio, aren’t for a second asking us to pity the athletes. We’re empowered by them—and perhaps even a bit embarrassed by their strength and their fight, if we compare it to our own. This type of documentary filmmaker is also capable of helping their subjects look inward. Matt Tyrnauer’s Studio 54 tells the wild story of New York’s most famous nightclub, but also acts as a therapist’s couch for co-owner Ian Schrager, who speaks frankly about some of personal demons that led to the club’s downfall. Also in New York, but on the other end of the spectrum, is James D. Solomon’s The Witness and Yance Ford’s haunting Strong Island. Both tell true stories of loved ones who were killed, but do so through the grief and pain and ultimately the catharsis of close family members. So this is not the category to talk about The New York Times or Frontline. These are filmmakers advocating for a cause, perhaps epitomized best by the career of Michael Moore. I’m a huge fan of Michael Moore. What he does is use the documentary form—unapologetically—to express his point of view, his opinions, his humor, his confusion, his frustration. But his movies aren’t simply opinion pieces. They are passionate pleas on behalf of the real silent majority—the forgotten man who just wants a fair shake. I also want to mention here one of my favorite documentaries of all time—Hotel Terminus, director Marcel Ophuls’ journey into the life of a monstrous Gestapo leader during World War II and the Holocaust, which won the Oscar in 1988. This is a four-and-a-half hour epic with the scope and characters of a Dickens novel. But there’s a palpable anger in Ophuls’ work. He’s furious about the crimes that were committed and the indifference of some people towards those crimes. Hotel Terminus is not objective; why should it be? His interviews are masterful. The film is biased and urgent and enraged. And the film is essential. I’ve been working with the legendary Werner Herzog. He just premiered his very fine film on the life of Mikhael Gorbachev. Werner gets uncomfortable when people point out some area that they consider factually incomplete. He says, “But I’m not a historian; I’m a poet.” I love that. Where does the truth fit into that concept? He’s not going to include false details in his work, but his films are about a feeling, something inscrutable. They are lyrical and ethereal and strange and unique. Werner made a 3-D documentary about ancient cave paintings; he found a way to access the soul of the cave men by talking to scientists about their past and their dreams. In Encounters at the End of the World, his beautiful film about Antarctica, the first thing Werner asks a penguin scientist is if it’s possible for penguins to go insane. Herzog says filmmakers should never be the flies on the wall; they must be the hornets who go out and sting. So many filmmakers take a different route to ask deeper questions—actress Sarah Polley, whose Stories We Tell floats like a dream backwards through her own family history, or musician Laurie Anderson, whose Heart of the Dog is an experimental visual ballad to her beloved pet. So here’s what I know about documentary filmmakers. They have the determination of a journalist, the insights of a historian, the generosity of a counselor, the fury of a political activist and the warmth and wisdom of a poet. A journalist, a historian, a counselor, an activist and a poet—it almost sounds like the beginning of a bad joke. But I can further help with the definition by telling you this: I know what a documentary filmmaker is not. A documentary filmmaker is not a stenographer. Cans of film alone are not a documentary. A documentary filmmaker is not a publicist. Some of the worst films I’ve seen are the ones that are heavily influenced by the subject. Beware of soft documentaries made by the subject’s best friend. That’s a birthday card, not a documentary. And lastly, a documentary filmmaker is not the audience. Too often we’ve seen filmmakers appeasing the audience by offering no perspective—or offering every perspective. But take the example of Grizzly Man, Werner Herzog’s portrait of Timothy Treadwell, a self-made naturalist who lived among grizzly bears in Alaska and was ultimately killed by one. Late in the film, Herzog shows footage featuring Treadwell ranting against employees of the park service and society at large, Herzog drops the audio and narrates in his own voice, “Here, Treadwell crosses a line that we will not cross.” I love that phrasing because it goes right to the heart of the matter. Herzog is saying, “This is where I—we—differ.” It’s essential. He is the filmmaker. We are the audience. And we should never settle for anything less. How many times have I seen audiences—and certainly film critics as well—praise the subject or a subject matter of a documentary while failing to discuss the filmmaking? Don’t fall into that trap. Be tougher than that. Because we are at a moment in time where there are more opportunities than ever to make and distribute your documentary. And when the very nature of truth is under attack at the highest levels, the documentary filmmaker takes on new importance. I need them in my life as much as I need journalism, history, counsel, activism and poetry. And so do you. For us and for them I’ll end with one word that’s taken on a whole new meaning in this whole new age: Resist.